First snow for the season. 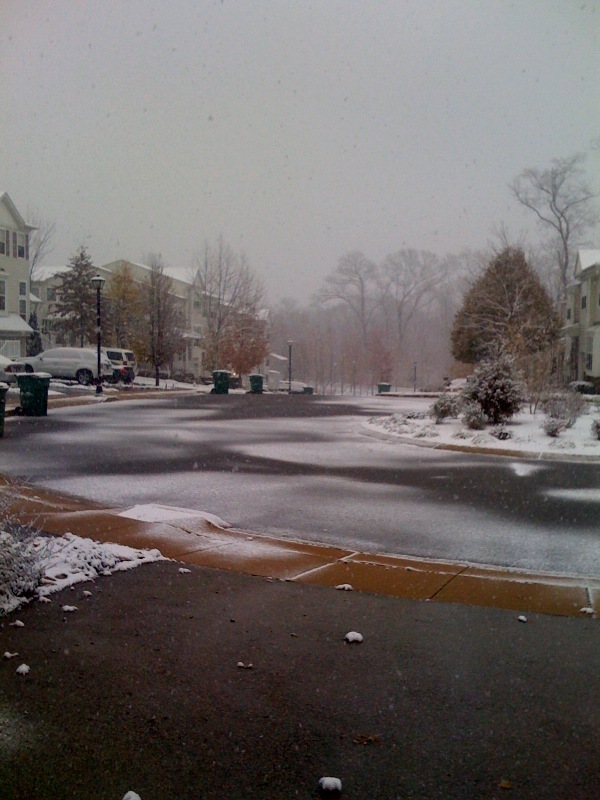 I stood by my deck door enjoying the sight of the soft snow flakes cascading down and melting as it touched the ground. I was tempted to run out bare foot and feel it but turned back to my stove instead. As much as I love the snow, winter is the least favorite of the four seasons for me. I love the crisp morning air of fall. The changing colors and the impulse to tug the jacket a little tighter for warmth. Hearing the news anchor talk of the falling temperatures and wind chill in the teens made my heart sink. Winter is here. Another 5 months of bone chilling cold, pulling on layers and darkness at 3:00 PM. I am looking ahead to April already! Next One year. One million memories. Ah the picture reminds me of good old day in Wisconsin. But move to California ;–) I can still wear half sleeved tops and sandals. This pic is a reminder to me that winter is starting. @SK: Don’t make me J! All these years I wanted to move to CA. Since my trip there in Sept somehow the charm has worn off. Yes as much I love the snow and the four seasons, in my 6th year in Detroit MI, I have to admit that I am getting a little weary of winter. We had our first snow last week. I love fall too. There are the occasional drops in temperature, but suddenly there is a 70F day, enough to keep my spirits high. I feel it is shortest season before it quickly blurs into winter. The first part of winter (after Halloween) is interesting because of the upcoming holiday season. Workplaces close here for 10 days during Christmas because the automotive Big 3 and their plants are closed. It is snow and light and decor everywhere. There is holiday music playing on 100.3 FM (WNIC, local Christmas channel). Come January and February, there is nothing but snow and more snow. Then I long for April-May. Life goes on. Wow! I wrote all that on an impulse. I wanted comment on your blog for some days now. I love your blogs and read them regularly. I come from a South Indian Iyer family and can relate to all the things you write about. I notice you have your ups and downs, but cheer up! All is going to be fine. Holiday cheers! @sl: Loved reading your comment. I get what you are saying. I love the festive season too. Happy Holidays to you too! That’s a post card pic Laksh! You live in a beautiful neighbourhood. We had 5cm+ on wednesday.fun for kids; not for me , specially the driving. have a good weekend..enjoy rasam for winter days. hey laksh,when i woke up seeing the same snow, I had predicted your post today will have a pic ..ithu eppadi irukku..(Rajini style)! i want to go to NY to see snow!! I remember so many days in sweltering heat in Chennai seeing pics of snow in movies/photos would so long want to be there!! But i guess its a different thing to live in a wintery place! @Maggie: Thats for sure! It makes me feel silly of the days when I dreamed of actually seeing snow. It is nice to watch the occasional snow but when you factor in scraping your windshield when the wind chill is biting through your jacket, you long for warmer climes. I’m with maggie on this one. The other side of the grass is always green. But that said, I also don’t like winter. Winter is depressing and boring. @Madhuram: True. Hope you are doing better now. Phone call long overdue. Tonight perhaps? @Apar,thanks for the link. Didn’t know, you are a chef too! @Shy: She is an awesome cook and was my inspiration for the food blog.